I've always been a fan of Japanese food, and finding one that is both delicious and affordable is fairly difficult. I tend to go to Rakuzen quite a bit due to its consistency across most of the outlets in Malaysia, but now, I think I might have found something new. Kicking things off with the most amazing selection of Sashimi Moriawase. Definitely my favourite in any Japanese restaurant, with its selection of air-flown Salmon, Maguro, White Tuna, Ikura, Scallops, Yellowtail and of course, your choice of a freshly pressed wasabi (horseradish). Fresh as hell, highly recommended for anyone who loves sashimi and definitely well worth the price. Next up, their Soft Shell Crab Salad, topped with Crispy Fried Fish skin. 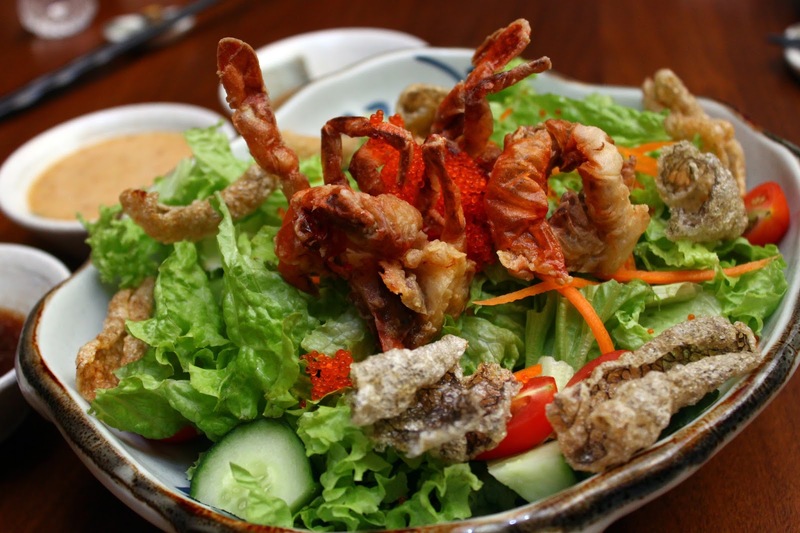 A fairly simple salad with generous amount of fish skin, as well as a whole soft shell crab, garnished with tobiko, and finished with their homemade sesame dressing. Now this my friends, is the star of the day. The most exquisite, luxurious part of a Bluefin Tuna - it's belly! Only 1% of an entire fish can be considered as the belly, and it's the most popular part of a tuna. It's smooth, it's creamy and the underlying sweetness was superb - it's a must-try for any sashimi lovers, at least once! Extremely rare in Malaysia, also incredibly pricey. However, I guess Kimi-Ya's version ain't too bad - only RM48 for 3 slices - which I have to say, is really affordable. Now, as much as I love Sashimi, I love my rice too. And this bowl is definitely something that I look forward to in any Japanese restaurant, if I don't plan on having anything heavy. It's fresh and delicate, making it really easy on the stomach. Anyone who loves egg or even Mentai-ko sauce will definitely like this dish. A creamy finish to something simple, a dish that can be eaten from day to day without feeling overpowered - a fantastic dish indeed. I love soup, and I love it even it's savoury. Without a doubt, this is my top 5 picks in Kimi-Ya, and I'd highly recommend! The body, the aroma, the textures and the quality in general, was great. Loved the salmon belly, and pretty much everything within this dish. Oh, they also provide a side of chilli paste to make your soup spicy! This is one of Kimi-Ya's specialty. Though I'm not too fond of Soba noodles, I found this to be fairly interesting. The portion of noodles will be used to dip in a clear soyu-based broth (the cup). To the broth, you can add in quail eggs, spring onion and wasabi - as much or as little as you like to tweak its flavour. Now who've thought to use Wagyu beef in a fried rice. Regardless, I would say that this plate of fried rice was well packed with Umami. It's richness can be tasted throughout each grain of rice, and having just half of this was satisfying enough. I'd recommend to share if you're not the type to indulge in heavy-tasting foods, but to most, it's not a problem. Like in every Japanese restaurant, Unagi Cheese Roll seems to be quite a popular choice. I mean I'm not too fond of it, but I guess it's okay. The unagi was tender and well-seasoned, and the cheese in the middle added a layer of creaminess. Overall, pretty good. Oh, before I forget, I'd highly recommend you to try the Cawanmushi - absolutely divine! For dessert, I had a serving of mochi dusted in soy powder, served with red beans on the side. So there you have it, a neighborhood Japanese restaurant with a fantastic selection of dishes, some of which are even air-flown weekly! They also tend to have monthly-promos to entice their customers to come back, like the Otoro (Tuna Belly) and many more. Free Valet Parking is provided, so don't worry about the parking. Just come on down and enjoy yourself with your friends and family! I personally do not like japanese food. Because i am an asian and we love spicy food and the seafood as well as semi cooked is not my type.